Then watercolor the background by spritzing the white card stock with water and randomly adding Stampin' Up! Elegant Eggplant and Wisteria Wonder inks with an aqua painter and set it aside until dry. 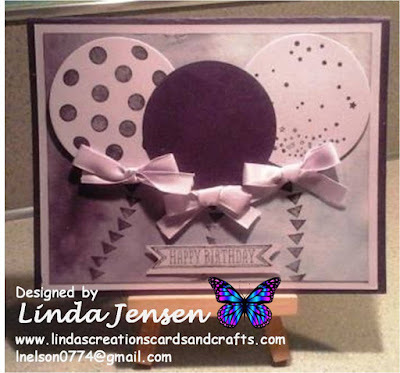 Meanwhile cut the balloons out of Elegant Eggplant and Wisteria Wonder card stock with Stampin' Up! Balloons Framelits dies. Then using a Stamp a ma jig stamp the spots and stars on the Wisteria Wonder balloons and leave the Elegant Eggplant one plain. Next attach the balloons to the background with mini pop dots then use a Stamp a ma jig to stamp the balloons' strings in Elegant Eggplant ink then attach the bows with hot glue. 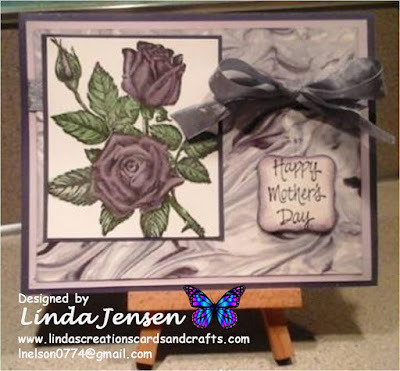 Next stamp the sentiment on Wisteria Wonder card stock in Elegant Eggplant ink, cut it out with a Stampin' Up! Bitty Banners Framelits die, attach it to the background with mini pop dots, attach the front to the middle layer then to the base and enjoy! Please let me know if you have any questions, I'm always happy to help. I always appreciate any comments/suggestions that you're willing to share. Thank you for stopping by, have a great day!